Today Twitter played host to a debate on the meaning of respect and tolerance, but 140 characters seem a little limiting for this particular exchange so I thought that pulling it out of this—slightly shady, slightly geeky—platform of intellectual ephemera might not be such a bad idea. Before you re-live the discussion and chip in with your own two cents, let me throw in some definitions of the English words that we discuss. I am fully aware that, on the one hand, these definitions can be disagreed with; and they should not resolve the matter or stifle the debate. But, on the other hand, our discourse often originates from—and gets stuck in—the different meanings of words in our respective mother tongues as well as different socio-political spaces. the ability, willingness, or capacity to tolerate something. Origin: from Latin, tolerare (see tolerate). or disagrees with) without interference. 2. endure (somone or something unpleasant) with forbearance. Concise Oxford English Dictionary, 11th edition 2008. To me, the problem seems at least partly caused by the attempt of the United Nations to instil a philosophical meaning into the word tolerance that it doesn’t seem to carry linguistically. So, here comes the debate (as of June 2, 2009 at 17:00 hrs) — read it from the bottom up, as the most recent entries are on top [UPDATE: It seems that Twitter is not really able to sort conversations chronologically—please don’t ask why—but you’ll probably get the picture despite the confusing order…]! :) Lovely. Adding hundreds of new characters to the debate seems to create even bigger confusion and at the same time makes me remain even firmer in the opinion that tolerance is so passé… And it makes me wonder – why was tolerance ever IN? Is it some kind of middle solution to which society should be striving or is it something that we should satisfy ourselves with, if proper respect, appreciation and understanding can not be achieved? Is what we are trying to promote to people that they should tolerate the other or rather “allow the existence or occurrence of (something that one dislikes or disagrees with) without interference”? Allow?! Really? Why was tolerance ever IN? Just looking at the definitions, I am tempted to say that it was in because UNESCO tried to overpower the linguistic meaning of the word with a philosophical one. I am sure someone out there knows better than I do. I just haven’t followed the development of the discourse around the term ‘tolerance’ at all. The “allow” is an interesting choice of words, isn’t it? But it’s honest, at least – it does not suggest that there is no inequality of power distribution. After all, if a group is holding power and controlling access to power, that’s exactly what they would do I suppose: they tolerate, they allow, they permit. Thank you Andreas for making this discussion available beyond the small circle Twitter users. As I’ve said most of what I think about this already above, in my discussion with Darek, I’d rather hear here many more opinions of lots of different people. But just to add to the question why tolerance was ever IN. I think that tolerance logically emerged from a time of post-colonialism where the idea of equality among people was not yet a wide consensus in society(ies). From the ‘you’re worse then we, so we rule you’-attitude it would have been too big a jump to ‘yeah – we’re equal’. It was easier to get to a ‘ok, you’re worse, but we tolerate and stop enslaving you’ attitude. It was similar with the move from a multicultural society to an intercultural, which still has not happened in most places. There is a deeply rooted racism, particularly in Europe. We just don’t use the word ‘race’ anymore. 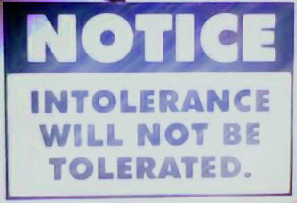 Tolerance might be a first stepping stone in trying to overcome this, but it certainly is not the end. At least I’m not working for a tolerant society. I’m working for a society in which everyone can be respected for who they are and is free to be at their best. In the article published on teachingexpertise that Mohammed aka midhal brought into the discussion, Dr Graham Haydon—lecturer in philosophy of education at the University of London’s Institute of Education—explores tolerance and asks whether it has, in the UK context, become an easy option. What is tolerance, and is it always right? He draws some essential lines of distinction between tolerance and positive recognition in law, on the one hand, and tolerance as a matter of underlying attitude, on the other hand. The status of homosexuality in Britain in the 1960s is a good model of what toleration, strictly speaking, means. Many people disapproved of homosexuality, but decided that it should be allowed anyway. In general, you tolerate something if you put up with it even though you disapprove of it. But what we mean by an attitude of tolerance is more complicated. If the question of tolerance only really arises when you disapprove of something or someone, then talking of tolerance between different groups implies that they disapprove of each other, and are, perhaps rather reluctantly, putting up with each other. But that suggests that we might disapprove of someone just because they are different: they have a different skin colour, or live in different ways, or have different religious beliefs. If we accepted the differences in the first place, the need to tolerate people for their differences wouldn’t arise. It’s no wonder that people do not like to feel they are merely being tolerated by others. Respecting people for who they are is a far more positive attitude than merely tolerating the fact that they are not the same as yourself.